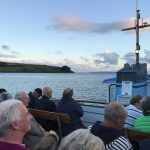 On Thursday 13 July 2017 the Friends had their annual evening cruise to St Mawes. 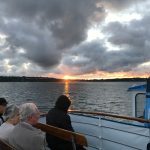 Eighty Friends departed from Malpas at 6.30pm, returning to Truro just before 10pm. 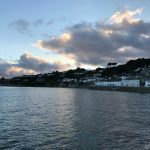 There was a drama as we approached St Mawes as the gearbox failed which resulted in the boat having to be towed into the harbour and we returned on another boat which was fortunately moored just off shore. 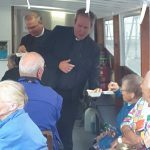 We enjoyed a pasty supper at the start of the trip and with an hour in St Mawes were able to disembark and purchase drinks and other refreshments. 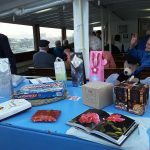 The photographs show the lovely raffle prizes, the Dean and Canon Alan enjoying their chip supper and the views of the sunset as we sailed back to Truro.